Windows Azure provides a great environment for dev/test. This is true both for scenarios where you want to dev/test in the cloud and then run the production app in the cloud, as well as for scenarios where you want to dev/test in the cloud and then run the production app using an existing on-premises Windows Server environment. Windows Azure’s new IaaS and Virtual Networking capabilities make it really easy to enable enterprise development teams to use the cloud to do this. Using the cloud for dev/test enables development teams to work in a flexible, agile, way without ever being bottlenecked waiting for resources from the IT department. Development teams can instead use the cloud in a self-service way to spin up or down resources in minutes. And then when they are ready to deploy their apps they can choose to do so using their existing on-premises servers. This makes it really easy to start leveraging the cloud even without having to fully bet on it yet for production scenarios. Below are details on each of the above improvements. The combination enables an amazing Dev/Test cloud solution, and an unbeatable offer for all MSDN customers. Prior to today, when you stopped a VM on Windows Azure we kept a reserved deployment spot for it inside one of our compute clusters, and continued to bill you for the VM compute unless you explicitly deleted the deployment. Now, with today’s update, when you stop a VM we no longer charge you any compute time for it while it is stopped – yet we still preserve the deployment state and configuration. This makes it incredibly easy to stop VMs when you aren’t actively using them to avoid billing charges, and then restart them when you want to use them again. This is great for a variety of scenarios (including production app scenarios). It is especially useful for Dev/Test scenarios, though, where you often want to cycle down environments in the evenings or on weekends if they aren’t actively being used. Now you can do so and not incur any hourly billing fees. Prior to today, our pricing model for compute resources on Windows Azure billed at the per-hour granularity. This meant if you ran a VM for 6 minutes in an hour and then turned it off, we would still charge you for a full hour of usage. Now, with today’s update, we are billing at a per-minute granularity. So if you run a VM (or Cloud Service, or Web Site, or Mobile Service) for only 6 minutes in an hour, we now only charge you for the actual 6 minutes of compute usage (we pro-rate the hourly price – so the billed price is num_minutes * (hr rate)/60). This is great for a variety of scenarios (including production app scenarios). It is especially useful for Dev/Test scenario where you are often cycling up/down resources in a very elastic way. Now you can do so and save more money. Prior to today, it wasn’t (legally) possible to use the dev/test server licenses provided with MSDN subscriptions in a hosted cloud environment. The product usage rights of the MSDN server licenses didn’t allow them to be used in either our cloud nor anyone else's cloud environment. Today we are announcing that we are changing the MSDN use-rights so that you can now use your MSDN dev/test software licenses on Windows Azure. This allows you to install and use your MSDN dev/test server images for SQL Server, SharePoint, BizTalk, etc at no extra charge within Windows Azure VMs. 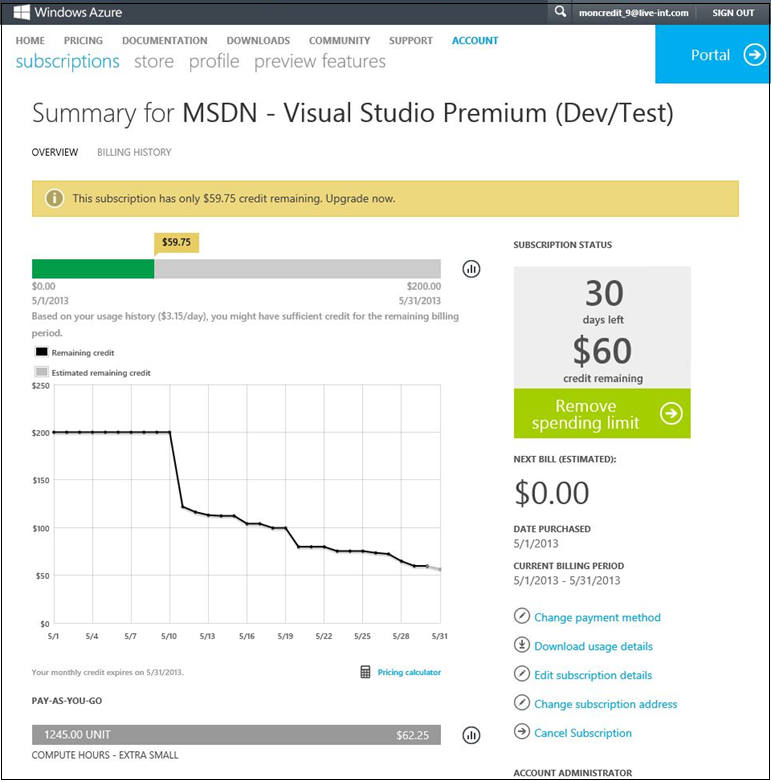 In addition to extending MSDN Use-Rights to Windows Azure, we are also today announcing a fantastic new billing rate for customers who have MSDN subscriptions. You can now spin up any number of Windows Server, SQL Server, SharePoint Server, and BizTalk Server VMs for Dev/Test scenarios using Windows Azure and pay only 6 cents/hr when running them (or if you run them less than an hour the pro-rated per-minute equivalent). The above savings are available to all MSDN customers – and can applied to any number of Windows Server VMs being used for Dev/Test purposes. We will automatically apply these savings when you create a VM using one of the standard VM images in the Windows Azure VM Gallery (either through the portal or command-line options like PowerShell) and run it using a new Windows Azure MSDN Subscription. We are making the above discounted rates even more compelling by also giving every MSDN subscriber up to $150 per month of monetary credits that can be used to run any Windows Azure resource for Dev/Test purposes. MSDN Professional Subscribers will be provided with $50/month, MSDN Premium Subscribers with $100/month, and MSDN Ultimate Subscribers with $150/month. These monetary credits can be applied towards any Windows Azure resource being used for Dev/Test purposes. This includes: Virtual Machines (both Windows and Linux), SQL Databases, Cloud Services, Web Sites, Mobile Services, Hadoop Clusters, BizTalk Services, Storage, Media and more. The previous per-unit restrictions in place with the old MSDN offer are also being removed – instead you now have a monetary credit that can be applied and mixed/matched on resources however you want. 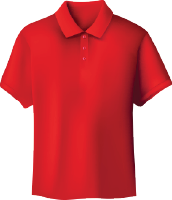 The above examples provide just a flavor of the different options now available with this program. The great thing about the monetary credits is that you can use them with any Windows Azure resource – so you have the flexibility to apply them in whatever combination you want. The credits themselves reset every month (meaning if you are a MSDN Premium customer the credits will reset to $100/month every month). So every month you also have the opportunity to change how you allocate them however you want. You can optionally choose to pay additional money on top of the monetary credit (meaning if you need $200 of resources in a month, the MSDN Premium Monetary Credit will cover the first $100 of usage and then you can pay the rest). Note that any overages will still take advantage of the MSDN Discount Rate (meaning the VMs will only be charged at 6 cents/hr) so you still benefit from a major price discount on that as well. By default we enable a “spending limit of $0” on MSDN based subscriptions to ensure that customers are never accidentally billed for usage above their MSDN credits. You can turn this of if you want to use more resources than the built-in credits support and pay for overages. One of the asks we’ve had in the past from Windows Azure Free Trial and MSDN customers has been for us to enable integrated UI support within the Windows Azure Management Portal that makes it easy for customers to better track where they are with their free credit usage. The above support is now available to both MSDN subscription customers as well as those signing up with our Free Trial, and should make it much easier to track free benefit resources. The above enhancements make Windows Azure a fantastic environment in which to do dev/test, and an unbeatable option for all MSDN customers. All of these improvements are now available to start using immediately. If you don’t already have a Windows Azure account, you can sign-up for a free trial and start using all of the above features today. If you are a MSDN subscriber make sure to sign-up using the same Microsoft ID (formerly LiveID) that is registered with your MSDN subscription. The Windows Azure sign-up wizard will then detect that you are a MSDN subscriber and automatically setup a subscription with the above improvements for you to use. If you already have an existing MSDN Subscription on Windows Azure you will be automatically migrated to the new benefits above in August. If you wish to opt-into using the new benefits before August you can visit the accounts center on the www.windowsazure.com web-site, and next to your subscription you’ll find the option to transfer to it earlier. If you’d prefer to continue using the existing MSDN benefits offer, you can also optionally opt-out of the automatic conversion and elect to continue to use that for the next 12 months. Exciting new developments. BizTalk Services combined with BizTalk IaaS will accord a rich integration story. Can you please clarify whether the MSDN Use Rights have only been extended to Azure or does this announcement apply to other public clouds as well? Thanks. I wonder if Azure can be used for a very very small site, like a blog with less than 500 access/month. There are any triggers to avoid hight costs? Maybe a threshold to avoit go beyond what you want to pay. So.. reading the above.. does that mean that I should not be using my 'free' subscription for hosting my company site? Does this apply to webSpark benefits too? Vitor, yes, you can set spending limits. Super exciting news! Now it is so easy to avoid being charged by simply stopping a VM, waited for long time. And the wonderful discounts provides much more resources under MSDN subscriptions. Everything is so good! Is the Stopped VM Billing only for MSDN based subscriptions or for all subscriptions types on Azure? these azure announcements that keep coming out are insanely great. no SLA(!!! ), no moneyback for service interruption etc., etc. Hopefully we can stick with the old model till 2014 August, but you need to explicitly set this: if not your subscription will be converted to the new model. All above is from the official msdn azure benefit faq. Victor, you can use Azure WebSites for these types of little workloads. You have 10 websites for free. Sounds great, but the 2 Virtual Machines I created this afternoon to try it out I cannot connect to either of them. Tried changing rdp port to standard port. tracert on vm ip dies somewhere within Microsoft's network (at least according to the internal ip provided). Website is all flash, substance is so far 0. The cost savings is nothing when I've wasted 2 hours of my time dealing with connectivity. This is bad news for anyone already running a production app. Please reconsider the 'no production use' restriction. Small consulting companies like mine run their company web site on their MSDN Azure account, and have little need for other Windows Azure resources. This great new pricing will only increase my bill, because I will now have to pay separately for production use. In addition to having to set up a separate production account and move my stuff to that account. I have already opted out of the new offer, which buys me some time until august 2014. Some great announcements here. Will there be the possibility to pool MSDN Azure Monetary Credits across groups of developers in one organization? For example: Org A has 100 MSDN Ultimate licenses? Can Org A pool $15k/month on a shared account for dev/test? An individual MSDN Ultimate credit is only useful for small R&D projects. If we have 100 developers, using Azure doesn't work with this model for continuous delivery/deploy scenarios to dev/test. I am actually a little offended by the removal of the production right. This was a balanced win-win for Microsoft as well as us, the developers. I deliver non-profit services using Azure and is currently not interested in paying x-USD/month. I hope you will reconsider. Hmm, while the lack of production use won't affect me much (have my own physical servers running Hyper-V for production use as it was/is cheaper overall long term) it does seem crazy that you can have 10 free websites if you sign up separately but can't use it for production use at all via MSDN?? Maybe you should provide a small amount of credit for production use - like enough for a small shared resources MS SQL DB and the 10 free websites. The no-production rule also applies to MSDN BizSpark holders who are specifically licensed to use their MSDN software in production? >>>>> I wonder if Azure can be used for a very very small site, like a blog with less than 500 access/month. We provide every user with 10 free web-sites that would all support this type of load. You can in fact load up wordpress and use a free mysql database to do this. >>>>>> The no-production rule also applies to MSDN BizSpark holders who are specifically licensed to use their MSDN software in production? No. You can continue to use your BizSpark subscription for both dev/test and production. The use-rights of BizSpark support both. >>>>> Is the Stopped VM Billing only for MSDN based subscriptions or for all subscriptions types on Azure? these azure announcements that keep coming out are insanely great. The Stopped VM and Per-Minute Billing apply to all Windows Azure Subscriptions. >>>>>> So.. reading the above.. does that mean that I should not be using my 'free' subscription for hosting my company site? Does this apply to webSpark benefits too? The new MSDN benefits offer (that has the additional features and services) is restricted to dev/test usage. So you can use it (+ your Visual Studio tools) to build and test your sites and applications, but you'd then use a normal subscription to run the site. If you are in the BizSpark program that includes Windows Azure benefits and you can use them for both dev/test and production usage. >>>>> Sounds great, but the 2 Virtual Machines I created this afternoon to try it out I cannot connect to either of them. Tried changing rdp port to standard port. tracert on vm ip dies somewhere within Microsoft's network (at least according to the internal ip provided). Website is all flash, substance is so far 0. The cost savings is nothing when I've wasted 2 hours of my time dealing with connectivity. Sorry you are running into this. If you want to send me email (scottgu@microsoft.com) I'd be happy to help investigate. What ports were you trying to connect to them on? Did you use the "Connect" button within the Windows Azure portal? That will download the appropriate remote desktop settings file with the correct ports setup in it. >>>>>> This is bad news for anyone already running a production app. The new MSDN offer has a bunch more flexibility and options (and lower prices for running things) but does have a dev/test only usage clause. If you'd prefer to use the older MSDN offer you can continue to use that. If you go to the accounts page you can opt-out of the new MSDN offer and continue to use the old one (which has fewer features/options but does allow dev/test) for at least another 12 months. >>>>>> Some great announcements here. Will there be the possibility to pool MSDN Azure Monetary Credits across groups of developers in one organization? For example: Org A has 100 MSDN Ultimate licenses? Can Org A pool $15k/month on a shared account for dev/test? An individual MSDN Ultimate credit is only useful for small R&D projects. If we have 100 developers, using Azure doesn't work with this model for continuous delivery/deploy scenarios to dev/test. We don't currently have a way to pool/aggregate usage. We are going to look at ways to enable that in the future. The new discounted VM pricing, though, should still provide big savings (at least 33% discount) for continuous delivery/deployment scenarios. >>>>> Hmm, while the lack of production use won't affect me much (have my own physical servers running Hyper-V for production use as it was/is cheaper overall long term) it does seem crazy that you can have 10 free websites if you sign up separately but can't use it for production use at all via MSDN?? Maybe you should provide a small amount of credit for production use - like enough for a small shared resources MS SQL DB and the 10 free websites. Each Windows Azure customer can have multiple subscriptions with Windows Azure (a lot of customers setup a different one per application they manage in fact). So it is definitely possible to use the free web-sites + DB option we have as well as the other free features. These are great changes, and really responsive to the feedback I have been giving (and hearing from the rest of the Microsoft development community). Can't wait to spin up a few new servers! But I have a question. Does the **"No Charge for Stopped VMs"** also applies to production subscribers? If my deployed instance is in the “stopped” state, do I still get billed? Scott, can you give more details on the policies MS will use to detect "production use"? I have a couple of VM and some web-sites. They are always up and running but they are only used for dev and test. Will you kill them after 120 hours? We reserve the right to suspend any instance (VM or cloud service) that runs continuously for more than 120 hours or if we determine that the instance is being used for production. This sounds great, but does the discounted rates and discounts also apply for MPN MSDN subscriptions? SLA or not, the restriction against "prod" makes my MSDN Azure a complete waste starting in 8/2014. Please ask the powers that be to reconsider for us small businesses and non-profits that have already hedged our bets by moving our sites to Azure. While potentially good for some, this feels like a slap in the face. Even worse is hiding the prod restriction in the small print (FAQ). This sounds good but when you refer to "VMs", are you talking about just the Virtual Machines or does the "no charge for stopped instances" include plain old cloud services as well? You say that as an MSDN subscriber I can run a Windows Server VM for $0.06 per-hour. Can you confirm that's just for a 'Small' instance (i.e. 1 CPU & 1.75GB of RAM)? Should I assume the larger instances will cost more? Is the Linux section of the Azure pricing calculator a good way to get an idea of these costs? i.e. an A6 VM (4 CPUs & 28GB of RAM) will cost $0.82 per-hour. I do like the direction Azure is moving to. Great news, thanks. "If you wish to opt-into using the new benefits before August you can visit the accounts center on the www.windowsazure.com web-site, and next to your subscription you’ll find the option to transfer to it earlier." How about Cloud Services? Will I be still charged for stopped Cloud Services? If yes, are there any plans to change that? using the portal, you can manage multiple subscriptions with the same LiveID account. 1. you write: "...and run it using a new Windows Azure MSDN Subscription" - i cannot find any details on this new subscription. Could you provide details. 2. Our (large) company has a bunch of developers and licenses for VS and MSDN - some of the licenses are benefits being a MS partner while others come from MSDN - but for some reason we only seem to have one live ID account with a MSDN subscription. Is there any way we can benefit from this offer without having to using that single login for every developer? 3. How is charging beyond the credit limit done? If i can't explain this service model to my boss in such a way that he can easily relay it to his, a frugal CFO, my companies not going to buy it. Please streamline the billing model and eliminate the need for separate subscriptions to manage test and production environments. Do Action Pack Development and Design subscribers get any MSDN monetary credits? Would be nice option to mark a vm/cloud service for "production". Multiple subscription is not an alternative! developing with a staging instance with the reduced msdn price, and doesn't care sla, or the 120 hours continous limit. switch (VIP swap) our test staging instance to production, and "happy" paying the regular production price. When I try to activate the new option on the subscription site nothing happpens. The links which states for "Click here" is also meaningless "https://account.windowsazure.com/Subscriptions#"....Do I make something wrong? This is great for MSDN subscribers, but will there be any discounts for TechNet subscribers? I am not a developer, but I am looking into Azure for deploying platforms for my clients. My company would not be able to say no to this if accoutn "Pooling" was allowed. I have been on several projects while at my company. Once I am done with the project, I can't just say that I am taking my Monthly Credits and moving on to my next project. The Dev and Test scenarios that I setup for the project need to stay running for maintainance and enhancements (or at least be available for "turning on" when needed). We may be able to make some of it work using individual accounts. But it would be hard to get buy-in if we have to keep track of which account is managing which Dev/Test Azure resource. Hi, This is really a great news. What about the security. Is it secured and the security considerations same as normal IAAS usage. Excludes Cloud Services. What a shame. Guess dev/test for my PaaS application will continue to drive up costs needlessly. Getting tired of defending Azure to my client, who would have preferred I developed for AWS (but "No" I told them, Azure is way better!). I suppose I could just spend a couple sprints reworking the app to work on self-service VMs (in which case, the client will probably get its wish and switch to AWS). Shame. When did Cloud Services become the Azure second-class citizen? There's some great news here! Count me in as very very interested in gaining the ability to pool MSDN Azure benefits across multiple subscriptions into a single account for an organization. If you're with the bizspark program, the benefits page makes no mention of the "no production" or 120 hour detection thing that the regular benefits page does. However, there is still no SLA. How do you specify if a particular instance belongs to production or dev/test if they are running under the same BizSpark MSDN license? I can't see the "Credit Status UI" though. Has it not been released yet? Are there some current issues when opting-in to the new MSDN monthly credits. I opted in a few days ago, received a message stating it would be activated in X hours. And now just yesterday, after getting access to the Biztalk preview, my subscription has been disabled saying : "The subscription reached a spending limit and has been disabled to prevent charges. Click here to remove the spending limit." If I look at the subscription page I see that Biztalk and data units are listed below the pay as you go section, rather than in the "included in your subscription" section" and appears to be the reason my subscription is locked out, whereas this blog suggests that it should be included in the subscription. Can you please confirm this is an issue that is currently being addressed? We have a number of production apps running on an existing MSDN subscription. I pressed the button to upgrade to the new billing model before I fully appreciated the implications. b) Failing that, does this mean I now have to move all of my production apps to a different subscription? If so, how? Loving the work the Azure guys are doing at the moment, big kudos to you all. One question, presumably a stopped VM still incurs storage costs for it's VHD even if it's not incurring compute costs? We have stopped all of the VM instances within one of our cloud deployments but it still shows the message "This deployment is stopped and is not accepting requests. You will continue to incur compute charges until the deployment is deleted" in the portal. Will we really still be charged or is this an erroneous message? Why we need to go for cloud computing instead of regular dedicated server based hosting? which azure?